I will admit, there are many things in this world I don’t understand. I don’t understand how people can be loud and obnoxious in the Quiet Carriage on the train. I have difficulties with comprehending the use of 3 kg of packaging for a single memory card. And I don’t get Pale Lagers. Unfortunately for me, this is the style for the second instalment of the “Blind Leading the Blind”. For me, I associate the term “Pale Lager” with all the fizzy, yellow, tasteless water I turned my back on years ago. It conjures thoughts of macro brews like XXXX Gold, VB, and Tooheys New. Maybe it’s this predisposition for hatred that works against my ability to appreciate a good pale lager when I drink one. That’s not to say I haven’t enjoyed a good lager now and again. Often, Stone & Wood’s Lager is the only decent beer available and I have sunk a few of those with enthusiasm, but was I enjoying the label, or was it a lager I could understand? With this month’s ‘Blind Leading the Blind’, I’m hoping that I can determine if lagers are something I can wrap my head around. To better understand the style, I decided to do a bit of research. The term lager actually encompasses a large variety of styles. Basically, anything that is fermented and conditioned with lager yeast at low temperatures falls under its umbrella. Aside from the well-known Pale Lager that most big breweries produce, styles such as Pilsner, Helles, and the darker Dunkel and Schwartzbier’s are all classed as lagers. For the sake of consistency, we’ve decided to exclude these additional styles and save them for another Blind Tasting. This style was chosen for a variety of reasons. The first being that I pay out Nick from chasingale.com quite a bit for his love of lagers and have often suggested he change the name of his blog to suit (to chasinglager.com, for those of you who are following along). Secondly, January houses a very important public holiday: Australia Day. The quintessence of the nation’s birthday is to don a singlet, fill up the inflatable pool, and crush a few ice-cold tinnies. If you’re having a hard time deciding which beverage to whet your whistle with this year, perhaps between Nick and myself, we can give you a few suggestions on which one to choose while you browse the aisles of your local bottle shop. Once again, the format is simple. I purchase 5 for Nick, he purchases 5 for me. 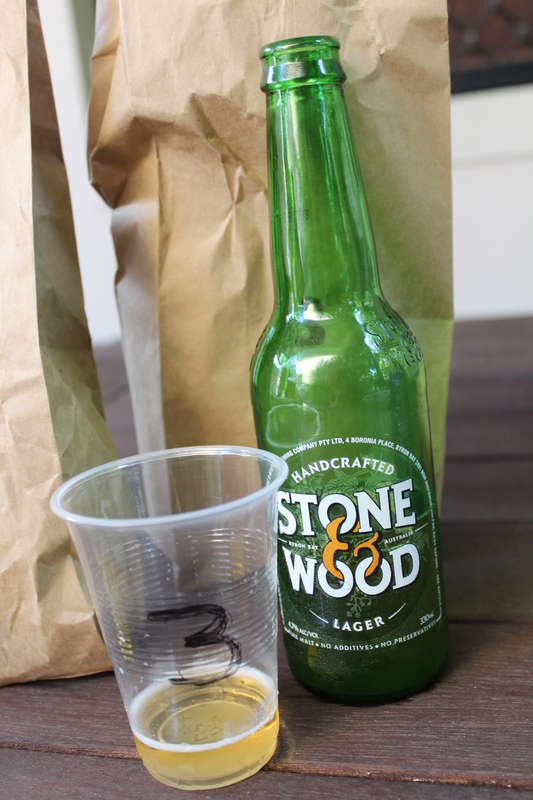 We decide on one “control beer”, with this month’s control being the previously mentioned Stone & Wood Lager. We also choose one beer we believe to be “evil” by being either a macro brew or a “crafty” beer (imagine me doing finger quotes with each of those). The other three are completely of our own choosing. I purchased the ones Nick tasted at Brewski on Caxton St (they do take-away, if you were not previously aware) and the bottle shop in the Palace Barracks (my apologies as the name escapes me). So with that said, bring on the beer! 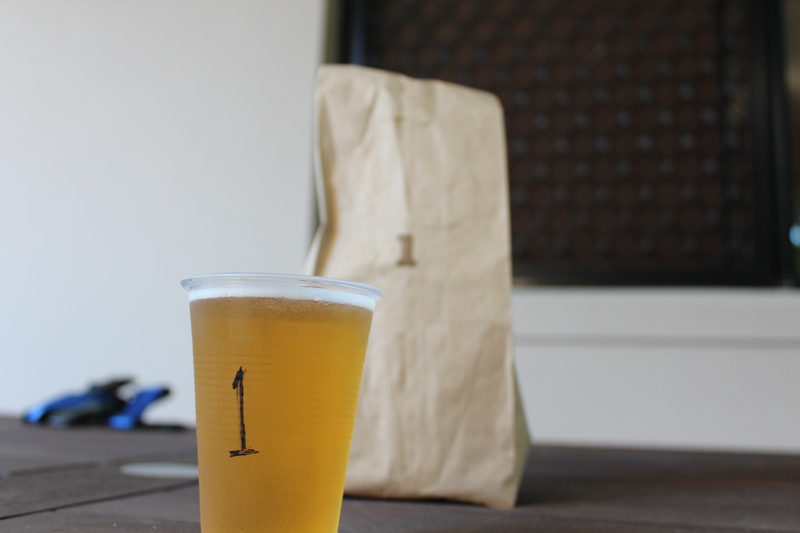 The first beer looks like, well, a lager. A light straw colour, this shows what kind of looks like a bit of sediment, but after a quick wipe of my cup, I realize that was only condensation. This beer contains very little, if any head, making the lack of aroma I’m getting off of it not too surprising. I’m getting scents of grain, and what I believe to be a noble hop smell. The occasional scent of summer flowers is also there. As this one came out, I noticed that it was the same colour as number 1. Am I being punked here? Are all 5 beers going to be the same and I’m just going to look a fool when I give them different ratings? The fact the head retention on this one was much better was the only indication visually that it didn’t come from the same bottle. Beer 4 was the darkest of the bunch, but that isn’t saying much. The light caramel coloured beer came out with a decent head on it, which gave off a very subtle, sweet aroma which was akin to melons. I was thinking I’d be in for a treat. 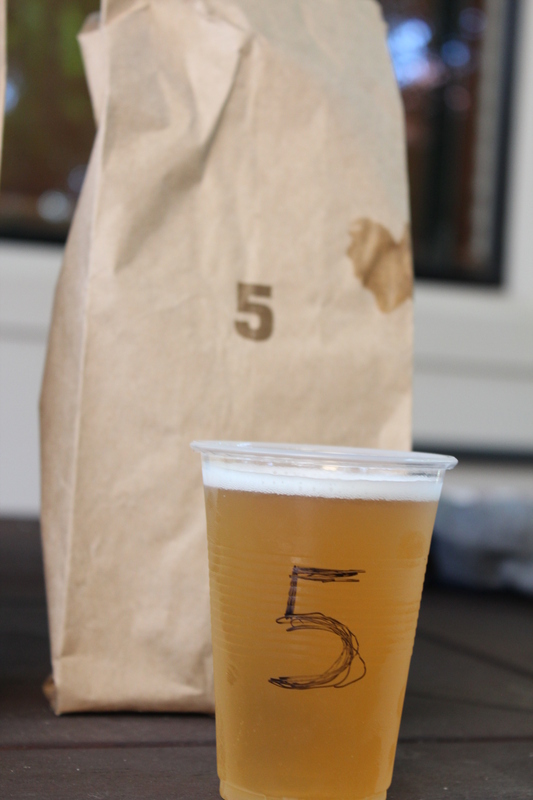 Appearance of the final beer for this session was identical to Beer 4. A slightly darker beer than the earlier lot and a good froth had looked appealing before, but was met with disappointment. Would this be any better? The first inhale brought a nose of fruits of many varieties, including stone fruit, melon, and grapefruit. Still more promise yet, but I took the first sip hesitantly. It was a difficult slog, but I managed to make it through all 5 lagers. 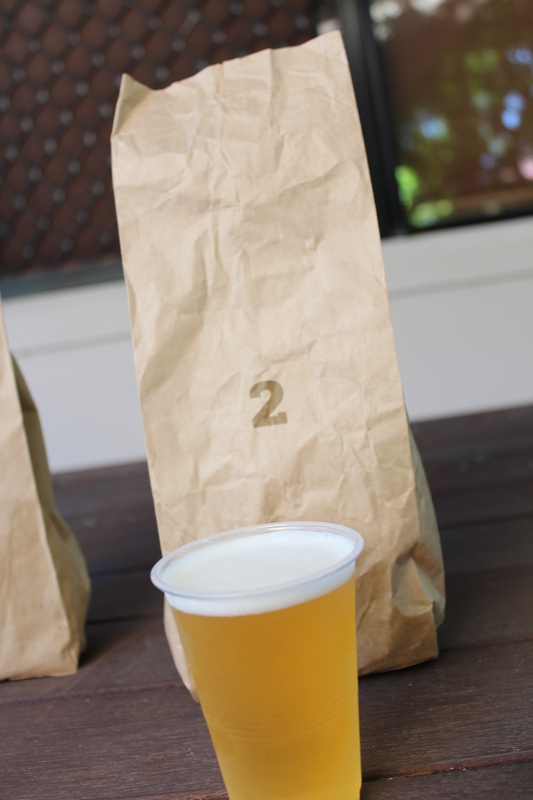 Each beer was brought out one at a time so they would all be cold when they were tasted. I had another taste through of what remained in my cups to see how they were when warm. This helped break a tie for third place and allowed me to come up with a final ranking. 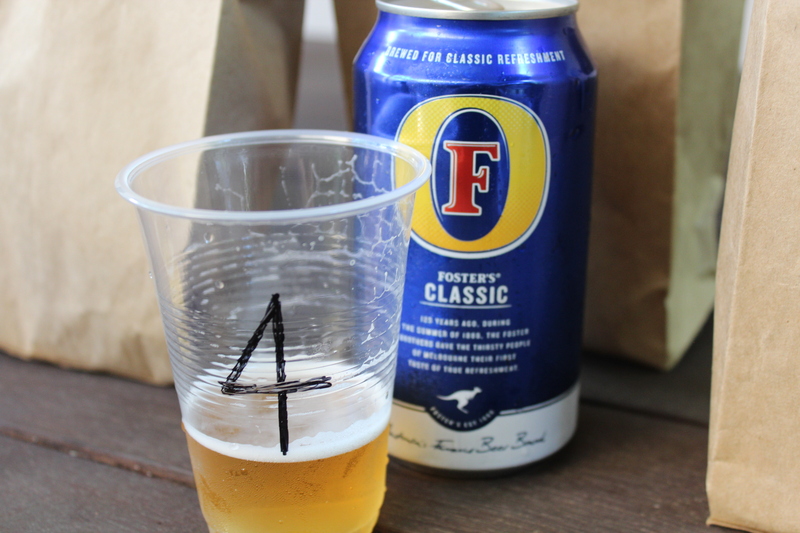 Who’d have thought Fosters, the Australian icon around the world (other than IN Australia) would make its way into the tasting. I’m now 2 for 2 for ranking the perceived “crafty or crappy” beer last, but I was a bit surprised I could pick it this time with my lack of experience with the style. The position on this one surprised me a bit. S&W Lager is something I have regularly when I go to restaurants or functions that have it as their ‘craft’ option and I’ve always found it to go down quite easily. Based on score, this actually tied with the Cooper’s Lager, but the warm test worked against Stone & Wood. There was additional sweetness and that Weetbix taste I got was much more prevalent and overpowering, dropping this work horse of mine to 4th place. As mentioned above, this was actually a tie for the bronze. Cooper’s did maintain some of its cleanliness and crispness when it was warm, which for me, gave it the edge. I liken Cooper’s to the Boston Beer Company of Australia. It’s been around forever and was really the only option for something that deviated from the standard pale lager for a long time. It’s also the only wholly Australian owned big brewery, and even rejected a take-over bid from the giant Lion (then Lion-Nathan). This history has helped to reserve a special spot in my heart for the Adelaide based brewery. As the Reserve Lager warmed, the flavour really started to jump out, but it was cloyingly sweet. As a cold beer, however, it was really quite delicious. 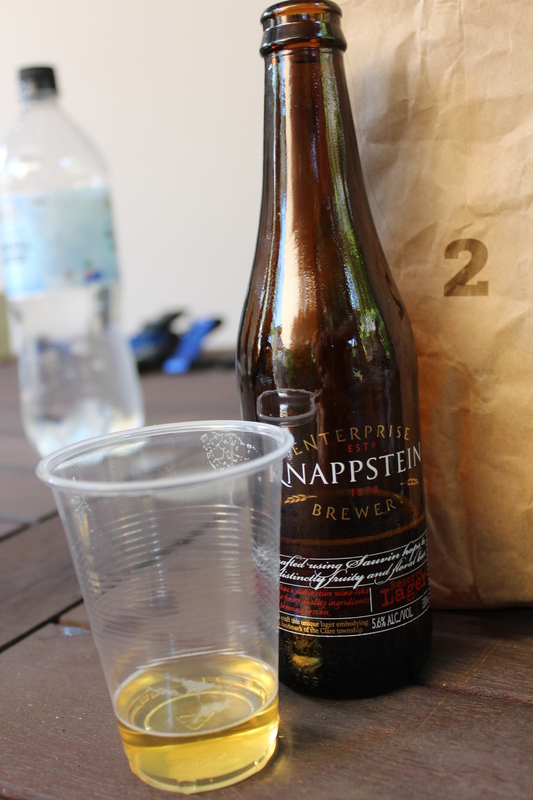 Knapsstien is one of those beers readily available in bottle shops like Dan Murphy’s and BWS, and is one that I cut my teeth on for Australian craft beer. I couldn’t tell you what I thought of it then, but this time around, I found it very drinkable. 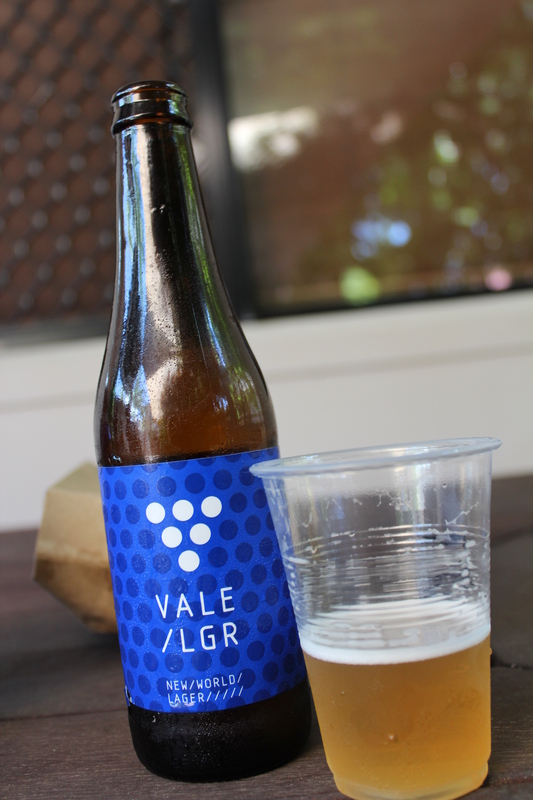 Vale was a silver medal winner on the first Pale Ale tasting last month, and takes the top spot this time around. If I ever consider drinking lagers on the regular, Vale may be the go to choice. When I look at the ranking, I am at a bit of a loss for words. It’s not to do with the outcome, but more to do with the fact that I am not sure how I would have ranked them if I had seen the labels prior to drinking. 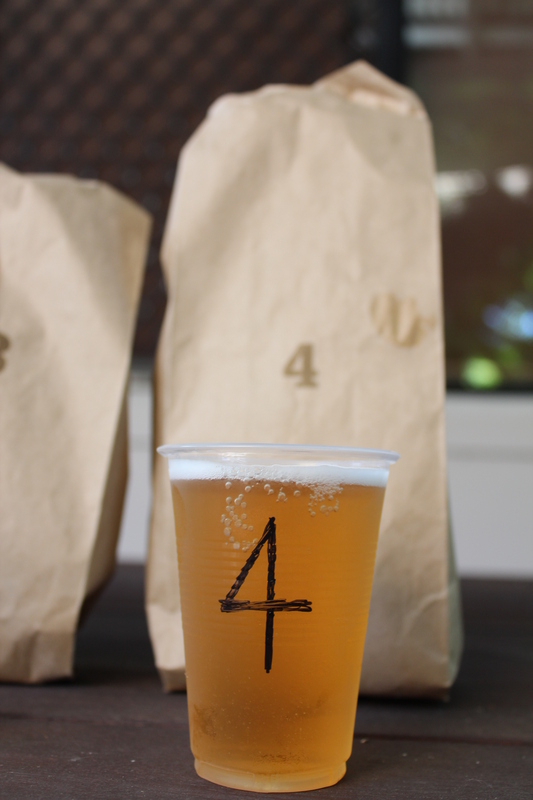 Foster’s would have remained in last, but the top 4 spots would have been up for grabs. This tasting has proven one thing to me: I like beer with body and substance. The light, crisp, dry taste does have its place though on a hot day, but I think I’d still lean towards a Pale Ale. I have gained a bit of an understanding now, however, and will be more open to the idea of sinking a few next time I’m out. Another point to note is that lagers DO have to be consumed nice and cold. They’re fermented cold and conditioned cold, so that hints to me that it needs to be imbibed cold. Stone & Wood lost the bronze position on its flavour when warm, but was a dead tie with Cooper’s when at its optimum temperature. There are plenty of other lagers out there, but it’s not a style that microbreweries tend to make regularly. This could be because of the extra time needed in the fermentation process, or perhaps it’s the stigma attached to the word. 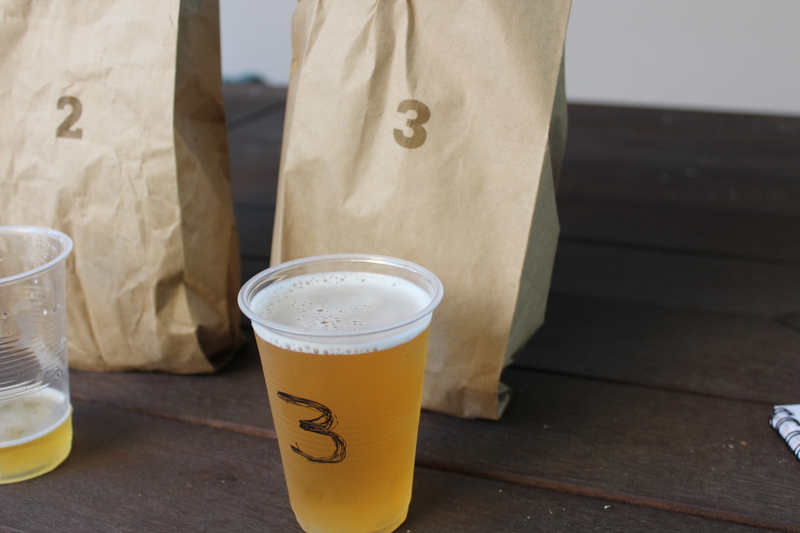 A few of Brisbane’s local brewers produce a version of their own, such as Fortitude Brewing and the Brisbane Brewhouse, but for the most part, the style goes largely overlooked. 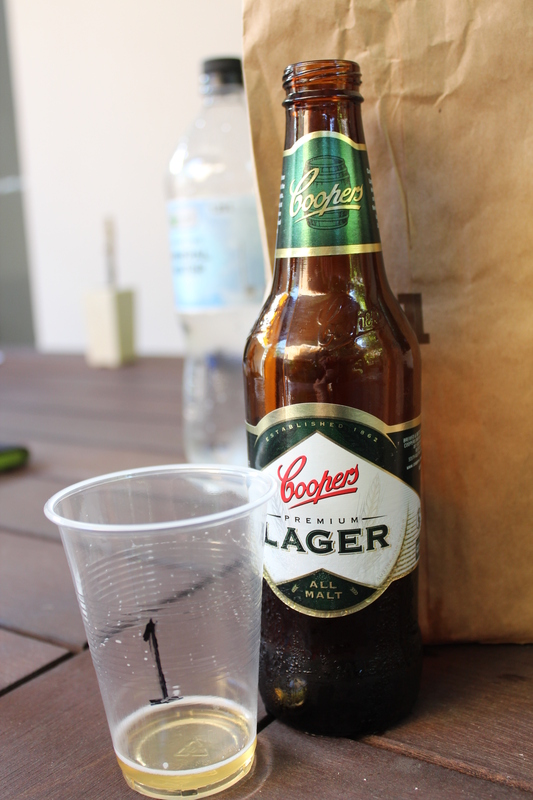 So while you’re at the bottle shop, wandering the aisles, and deciding on a tipple to go along with your Australia Day BBQ, give some thought to the humble lager. Try a couple and maybe even have a go at the few I’ve mentioned above. You should also go to www.chasingale.com and see his review on the lagers I purchased and he tasted. He’s more of a lager nut, so his may be a bit more insightful. Next month’s Blind Leading the Blind will be one that I can better understand: IPA! Since the style is a staple of the craft beer market and there are such a wide variety of them out there, we’ll be breaking it down and selecting only IPA’s from the state of Victoria. Those of you who are a bit keen may see what we’ll be doing with it! As before, we’d love to hear your suggestions on ones you feel should be included.